El primer día de Bicing, originally uploaded by Alícia. 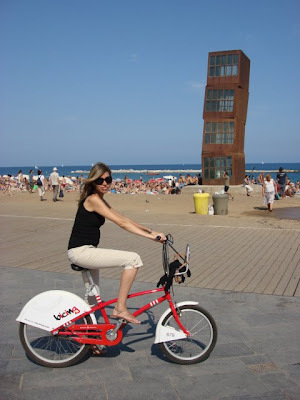 A funktastic insight into Barcelona's Bicing bike share programme. 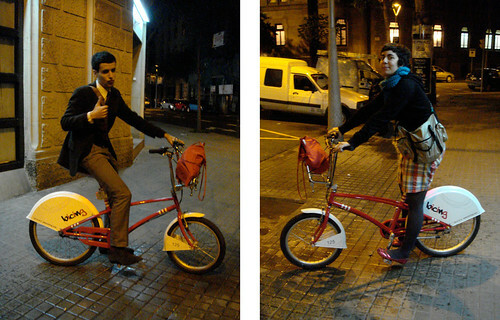 The photo was taken by Alícia on Flickr and shows two cycle chicsters trying out the Bicing bike on the first day. There are many wonderful reasons to love city bikes and bike sharing programmes. Here at Copenhagen Cycle Chic we're particularly thrilled with one specific reason. 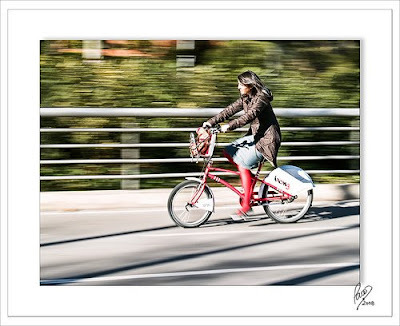 People borrow the bikes in their regular clothes - preferably chic. You don't see anyone slapping on the lycra and all the other gear to head down to the city bike racks. Normal people riding bikes in normal clothes. That's one massive step towards normalising urban cycling. After exploring the Bicing in Barcelona for this post, I realised that there are so many bike sharing programmes around Europe. I didn't realise there were so many. The big cities get the big press coverage, but there are over 100 cities in Europe with bike share progrommes, according to the very fine Bike-Sharing Blog. From Sevilla to Trondheim. From Dublin to Prague.